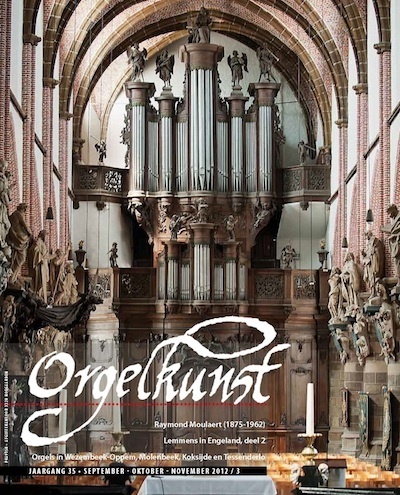 Orgelkunst informs readers of what’s happening in the Flemish organ world and beyond. Organists, students and professors from music conservatories and university musicology departments, full- and part-time private organ teachers, organ builders and designing specialists, authorities on the organ, researchers, art and cultural historians, church musicians and those involved with church music, organizations devoted to the organ, concert organizers, music publishers, CD recording labels both domestic and international; young students of keyboard and organ, amateur organists, music enthusiasts, local historians, concert-goers, those interested in organ music. The magazine was founded in 1978 and contains articles about restored and new organs, organ compositions, personalities, organ events such as festivals and competitions, current organ news, an extensive organ concert schedule and an index of international organ magazines. Orgelkunst has had its own CD recording label since 2005, focusing on the Flemish organ scene, with Flemish organists presenting works predominantly from the Belgian organ literature which have not yet otherwise been recorded. The added benefit of the updated website is an outlet to recognize the Flemish organ legacy and organ activities in the surrounding area, both domestic and abroad.